In The Enchanted Sonata, musician, animator and author Heather Dixon Wallwork, seamlessly blends the stories of The Nutcracker and the Mouse King and The Pied Piper of Hamlin (with some Disney magic and Neverending Story elements thrown in there for good measure). The story begins on Christmas Eve with 15-year-old piano virtuoso Clara Stahlbaum practicing the piece she has written for the big Christmas concert. When she is opening presents with her mother and brother later that night, Clara discovers a mysterious package with her name on it that contains a nutcracker and a book. Intrigued, she begins to read the story and her world melts away as she bears witness to the events in the book as they unfold. In the land of Krystallgrad, where giant rats are kept at bay by soldiers and big walls, the Prince is weeks away from his coronation to Emperor but he has doubts about his ability to rule because he has never been proven. One night, a magician travels throughout the empire and lures all the children out of their beds with a song from his flute that only they can hear and turns them all into toys. As all the soldiers in the land convene to find and take down the magician, he transforms them into tiny, lifeless nutcrackers. While the magician turns the prince into a nutcracker as well, he is 8 feet tall and can still move and talk. The purpose of this becomes clear when the magician levies the ultimatum that he will turn all the children back if the prince can prove he is worthy of the title emperor. The Prince, as the Nutcracker, must lead his citizens to defeat the magician without letting them know he is the prince. Before the Nutcracker can say or do anything, he is whisked away by fairies to a faraway land. Imagine Clara’s surprise when she turns the page to find that it is her world the prince was taken to and she is now part of the story. Even as she believes it’s a trick of her tired mind, she is transported to the enchanted empire where she must team up with the Nutcracker to defeat the magician who uses music as magic. Even though I enjoyed this book, my feelings about it are two-tiered. I feel like I need to review it like they do figure skating basing it on artistic merit but also technical accuracy. Dixon-Wallwork did a phenomenal job blending two well-recognized stories into a new but familiarly engaging tale. I have to admit, my knowledge of The Nutcracker and The Pied Piper was negligible so I looked up their summaries. While it helped me in this review to have the background, there is no real need for the average reader to delve too deep. Elements from both tales were transformed into a whirlwind adventure. I admit that it took a while to get into the story. Once I did, however, I found it hard to put down. I enjoyed the concept of music being magic that can be used for evil and good. The story of loss and what it had done to all the main characters made them more human and 3-dimentional. The deft story-telling wove a tale that included many characters, but they all had depth and you felt true empathy for them. Clara and Nutcracker’s relationship evolves naturally. While the timing of the story takes place over 2 days, the conversations and situations they find themselves in creates a bond between them that makes sense. I feel they are both far too young to make any life-long decisions (I know… different time, plot-necessitated age limit… I don’t care. Fifteen is too young!). However, by the end of the book, their mutual respect and admiration for one another has been tested and survived so you can forgive their youth. Honestly, I would love to see this realized as a movie. The tale is fast-paced and I feel it would translate well to the big screen. It’s rare that I feel like I would enjoy the movie more than the book, but there were issues with the execution of the tale that made for laborious reading at times. First, I feel that the author on several occasions used words that one would find on a more intense section of a vocabulary exam. There were many times I had to look up a word the author used: sprezzatura, enfilades, susurrus, munificence, sostenuto, pother… just stop it already. We get it. You know big words. As the author was once a music major, and the book revolves around music, I’m sure many of these have a more prominent place in the music world. But by using these words instead of their more mundane counterparts (nonchalance, gunfire, murmuring, generosity, sustained playing, and commotion… in case you were wondering), you take the reader out of the story because it becomes a road block in their flow. Every time I hit one of these words, it made me stop to try to think what it means and when I came up empty, I looked it up. People shouldn’t need to consult a dictionary on a regular basis when reading a book meant for young adults. Nutcracker shut him mouth a clack. (Chapter 20, roughly 7 paragraphs down). So yes, it was rough reading at times. I had an e-book so maybe there were mistakes present that are not in the printed version. I can only hope that’s the case because updating an e-book is much easier than a reprinting. Still, even with its technical flaws, I enjoyed the story of The Enchanted Sonata. If you want a fun new twist on some classic stories and enjoy vivid descriptions of enchanted people and places, you should give it a read. 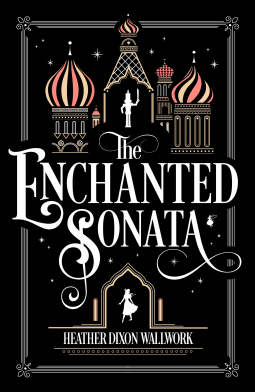 The Enchanted Sonata was written by Heather Dixon Wallwork, who has worked as a storyboard lead for Disney and is the author of two previous novels. Dixon Wallwork is a musician, animator and author. Working under Disney Interactive, she has illustrated for many popular franchises including Lucasfilm, Marvel and Pixar. Next The Upper Darby Summer Stage Shooting Stars present a Holiday Spectacular!